Halloween Blood Fountain — Carly! You Goonie! 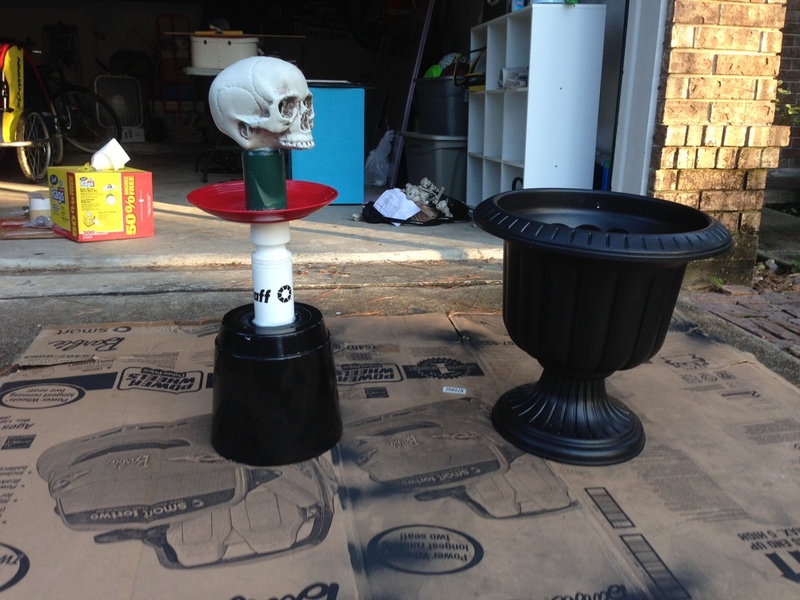 Halloween is absolutely my favorite time of year and I wanted to make a working blood fountain to go in the cemetery we put in our front yard. The hardest part was finding all of the pieces and figuring out how to put them together but I was pretty happy with the end result. I did learn a few things from this attempt. I will likely look for new pieces and try to make an improved version next Halloween. The plate I used under the skull needed to be a different shape, but I used what I had on hand. When I make a second fountain I will also paint it differently to make it look more like concrete. To get started I gathered the pieces I would need to fit the fountain together. I bought a large plastic urn from Garden Ridge to be the base. Inside that I placed an upside down plastic trashcan. The other pieces were plastic water bottles and plates that I had on hand. I had to play with a couple of different combinations of pieces before I found the right fit. Once I found the setup I was most happy with I used my Drimmel tool to make holes in the top, center of each item so that I could run tubing all the way through. This kicked up so much plastic dust and tiny pieces, so if you do something similar make sure you protect your eyes and face. After the holes were drilled through each piece of my fountain, I also made holes in the eyes of the skull I had so that the blood would have a place to flow out. Once I was satisfied that all of the holes lined up properly I glued all of the pieces together using E-6000. 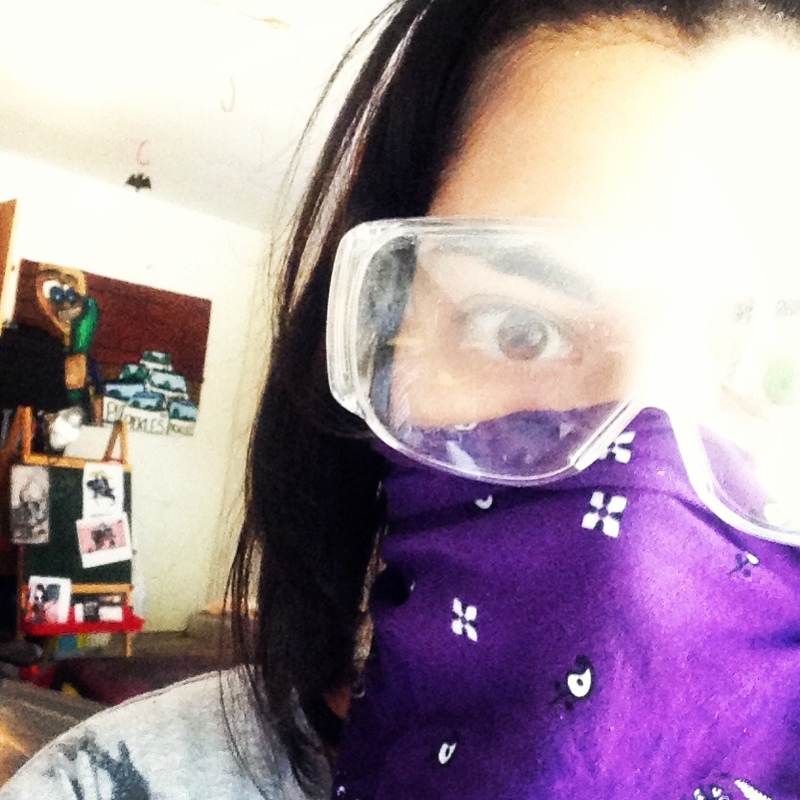 This is serious adhesive so I wore gloves and kept my nose and mouth covered while I was working with it. It took a couple of days for the glue to fully set and be ready for the next step. Next I primed and then painted each piece. The pump is a small fountain pump from Home Depot and I placed it under the trashcan that is used as the base inside the urn. The tubing then runs up through the whole creation into the skull. For the blood I mixed a bucket of water with a ton of red food coloring. Make sure you wear gloves and use something with a long handle to stir your blood mixture or you will have quite a mess. I'm pretty happy with the end result and it served us well in our cemetery. My next attempt will be much cleaner!